Afarin Azad — Textfield, Inc. This is the seventh annual issue of Pages, a publication that serves as a public discourse between the academic community in the West and Iran. 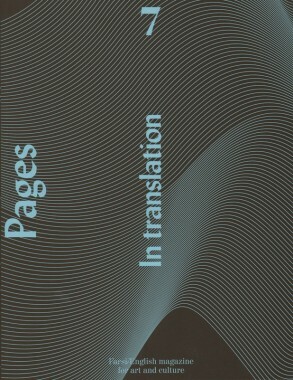 The editors of Pages were inspired to scrutinize the various aspects of translation because they confront it with every issue of their journal. “There is clearly no such thing as a perfect substitute in translation,” the editors write. “There are instead displacements and interpretations, which remain nevertheless within the limits of the text.” An instance of cultural practice and political agency, translation does more than create a space between languages or among cultures. An innovative look at how translation affects the spatial and political arrangements of public and private spaces of cities, as communal or individual identities, in representations of state media, and in artistic practice itself.